Unlike other letter variants such as "long s" which originally were orthographically distinctive, r rotunda has always been a calligraphic variant, used when the letter r followed a letter with a rounded stroke towards the right side, such as o, b, p, h (and d in typefaces where this letter has no vertical stroke, as in ∂, ð). In this way, it is comparable to numerous other special types used for ligatures or conjoined letters in early modern typesetting. Example from early printing, from a page printed by Pablo Hurus in 1496 in Zaragoza, Spain. The sample includes the types for r rotunda (marked red), ordinary r (marked green), and Tironian et (marked blue). 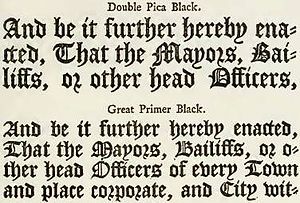 Example from 18th-century typesetting in England, William Caslon & Son's Specimen printed by William Caslon I (1692-1766) in 1763 in London. The sample shows r rotunda used in the words or, Mayors and corporate. Also seen in this sample are the ff and ct ligatures. This symbol came in several different shapes, all of which were of x-height. The shape of the letter used in blackletter scripts Textualis as well as Rotunda is reminiscent of "half an r", namely, the right side of the Roman capital "R"; it looks similar to an Arabic numeral "2". Like minuscules in general, the origins of the letter are in cursive writing as it was common during the medieval period, ultimately derived from scribal practice during Late Antiquity. The r rotunda shape of cursive r resembling the numeral "2" is also found in a number of medieval scribal abbreviations containing r, e.g. in the signs for the Latin word-final syllables ram, -orum and -arum. There are variant forms for the r rotunda glyph. Also found in Textura manuscripts is a very narrow second variant, in the form of one solid diamond atop another atop a vertical stroke. Another form found in German typefaces was a variant of that previous, with the part of an "s" that looks like an integral sign atop something rather like a "c". It can be found used as the second "r" of a pair and after "e". A fifth form, used in the 18th century in some French italic typefaces, was a derivative either of the Schrift form of the minuscule "r" or of similar typefaces used elsewhere. Its form was of a backwards "J" set just after the same shape rotated 180 degrees. They were separated by a space smaller than the stroke width between them, and the whole character was slanted as though it were cursive. As this typeface had the "d" that curved to the left, it was used after that character as well. By then, though, the character was the same width as a regular "r" so it was maintained because it appeared to its users to have some elegance or to remind them of prestigious old calligraphy. The abbreviation etc. was typeset using the Tironian et (⁊), as ⁊c. in early incunables. Later, when typesets no longer contained a glyph for the Tironian et, it became common practice to use the r rotunda glyph instead, setting ꝛc. for etc. Use of the letter form was never widespread except in blackletter scripts and so it fell out of use in English in the 16th century as roman scripts became predominant. Modern cursive scripts use a letter r that has a resemblance to the r rotunda. Few sans-serif fonts include an r rotunda. An exception is Apple's typeface Geneva, included with MacOS. The letter was proposed to be added to Unicode in 2005, in the Latin Extended-D block. As per Unicode 5.1 the encodings are U+A75A Ꝛ LATIN CAPITAL LETTER R ROTUNDA (HTML &#42842;) and U+A75B ꝛ LATIN SMALL LETTER R ROTUNDA (HTML &#42843;). Before, the Medieval Unicode Font Initiative (MUFI) had allocated it in the Private Use Area (PUA) of medievalist fonts at U+F20E and U+F22D. Since the characters are available in Unicode, MUFI recommends that the Unicode code points be used, not the PUA code points. Some fonts treat the glyph as a mere stylistic variant of "r" and may make it available by smart font features, e.g. Open Type 'hist', 'hlig', 'calt', 'salt' or 'ss**'. Latin Extended-D also has characters for medieval scribal abbreviations. Among them is the abbreviation for the syllable rum, consisting of a r rotunda with a cut, resulting in a shape very similar to the astrological symbol for Jupiter (♃). ^ Updike, Daniel Berkeley, Printing Type – their History, Forms, and Use, Vol. I, Boston, 1922, p. 109. ^ Haugen, Odd Einar, ed. (5 July 2009). "MUFI Code Chart Order Version 3.0" (PDF). University of Bergen. ISBN 978-82-8088-403-9. Retrieved 24 March 2019.